Mysterious and emotionally charged, the works of Maria Priymachenko, a folk master of Ukrainian decorative painting, seem to absorb the age-old traditions of many generations of Ukrainian master-craftsmen who, from the depths of the centuries, have brought forth their understanding of good and evil, of ugliness and beauty. What is the source of this master's creativity? What is it that attracts numerous admirers to her works? The present publication will attempt to answer these questions. Maria Priymachenko was born in 1908 in the village of Bolotnya, near Chornobyl, Kyiv Region. In her childhood she contracted polio, and this grave illness affected the girl's life: she grew a thoughtful and considerate person, having kindness, compassion and love for every living thing. At an early age she took to painting, she used to paint the interior of her home and of her neighbours. It often happen that a professional artist discovers a gifted person. This was the case with Maria Priymachenko: her talented works caught the eye of Tetiana Floru. In 1936, Priymachenko was invited to join the experimental workshop of the Museum of Ukrainian Fine Arts in Kyiv, a de-facto school for folk master-craftsmen. She proved to be a prolific artist - becoming involved with drawing, embroidery, painting on ceramics (the ceramic forms were made by potter Yakym Herasymenko on a potter's wheel). In 1936 Maria Priymachenko took part in an exhibition of folk art and won a first-class diploma. Since that time she has become a permanent entrant in scores of national and international art shows. Priymachenko continues to reside in Bolotnya, having no desire to leave. It was precisely Bolotnya with its scenic surroundings, its tenor of life and traditions that determined the routes of Priymachenko's artistic quests. Her creations present a genuine synthesis of material, of the fantastic and the subconscious. Images often appear to her in dreams first and later materialize in her compositions. The link of M. Priymachenko's art with ancient crafts is obvious: her compositions depict fabulous beasts born of mythology. Undoubtedly, her art takes its roots in folk legends and fairy-tales, and is nourished by life itself, as well as by the deep-rooted culture and folk art of the Ukrainian people. The works of Priymachenko can be subdivided into thematic, symbolic and ornamental pieces. All compositions are characterized by a subtle and fluent rhythmical arrangement. There is a maxim: "Style makes man." As for Priymachenko, one can state this in reverse: man makes style, for Maria Priymachenko has developed a style of her own. In this evolution one can discern traces of constructivism (1930s); the victory of harmony (1960s- 1970s); and the decorative approach (1980s). Her latest works impress one by their daring decorativeness of form. Priymachenko gravitates to the world of fairy-tale and mystery: her birds, beasts and plants interact on her pictures just as harmoniously and easily as they do in natural surroundings. Philosophy of the good animates the content of her works. The good embodied in the images of 'kind' beasts and birds (lions, bears, hares, storks, swallows) is juxtaposed against the evil, this mighty force which is sometimes difficult to identify with certain living things. The artist often resorts to her favoured device of personification: she depicts fabulous animals with large eyes surrounded with a trim of eye-lashes. Thematic compositions occupy a special place in Priymachenko's creative legacy as far as the complexity of compositional arrangement and harmonious balance are concerned. Raw actuality and fairy-tale become blended in her compositions into one single whole, triumphantly demonstrating the unity of Nature. People depicted in these compositions are composed and full of dignity and self-respect. Her early compositions were executed against a white background, associated with the whitewashed walls of peasant cottages. But in the 1970s-1980s the artist turned to coloured backgrounds. It seems that colour itself creates the effect of colour-bearing space. There are no professional secrets in her arsenal: she paints on Whatman paper with factory-manufactured brushes and uses gouache and water colours. She prefers gouache which gives a bright and thick decorative base with graphic contours. Apart from searches in colour scheme, the artist strives to achieve expressive outlines and an effective rhythmical arrangement. Another salient feature of Priymachenko's art is a keen sense of composition, which is especially evident in her choice of format. Horizontal formats are most suitable for topical and multifigured compositions depicting subsequent scenes of the narration, while the vertical format is used for representative decorative compositions. The originality of the artist's imagery is revealed in her unique formal and stylistic discoveries (the depiction of trees, simultaneous representation of a cottage's interior and exterior, etc.). The struggle between good and evil permeates all of Priymachenko's works. Good always triumphs in her compositions. But the motif of exuberant joy often gives way to sorrow and grief (a grave adorned with flowers and rushnyks is frequently depicted on her pictures). In 1986 Priymachenko executed works illustrating a tragedy in the life of the Ukrainian people - the accident at the Chornobyl Atomic Power Plant. This series again centres around the conflict of Good and Eevil. People generously endowed by Nature rarely confine their talent to one particular field of creativity - their talent manifests itself in every sphere. Thus Priymachenko is also a poet who writes captions to her own pictures: these captions are very melodious and easy to remember. Verbal and visual images complement one another to create genuine synthesis. Maria Priymachenko is also well-known as an illustrator of children's books, e. g., The Crane and The Stork Takes a Shower by Mykhailo Stelmakh. The significance of Priymachenko's creative legacy lies in the fact that it links ancient cultural heritage with the present. Maria Priymachenko's son, Fedir, is also an artist with a unique style who has inherited the finest Ukrainian traditions from his mother. Maria's grandchildren paint as well. Therefore, this family serves as an example of artistic traditions passed on from one generation to another. Due to her talent and industry, Maria Priymachenko was destined to become a genuine master whose creations have proven a milestone in contemporary art. © Видавництво "Мистецтво", 1972. Стаття та впорядкування © Василь Нагай. Katerina Bilokur is an highly original Ukrainian folk artist. 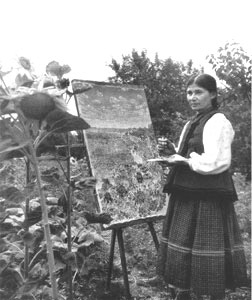 Her beautiful pictures of the colorful Ukrainian nature are a significant landmark in the history of Ukrainian folk art. Katerina Bilokur's life was not easy. 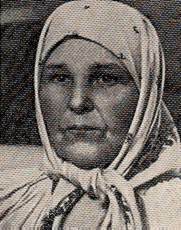 She was born December 7, 1900, in the village of Bohdanivka near Yagotyn town, Kiev region, into the family of a poor peasant. She had no possibility to study at school and only her thirst for knowledge helped her later to fill up the gaps in her education. Gradually, love for art forced out all the other flames. Her parents attempts to distract her from that "good-for-nothing" pursuit were in vain. Studying attentively nature, she gradually enriched herself with new impressions and penetrated into the mysteries of painting, design and drawing line. The first works of Bilokur (1920s—early 30s) were amateurish. They were the portraits of her relations and villagers executed with charcoal and self-made vegetable paints. The second half of the 1930s was an important period in her creativity. Then she look to drawing still-Iifes. Even her earlier works — The Birch (1934), Flowers by the Fence (1935), Flowers (1936) and some others clearly showed her exceptional creative abilities. Ingenuity of selection of subject matter, vitality, fanciful composition and harmony of colors characteristic of these pictures became the main features of all the work of the artist. Bilokur's paintings were first displayed at the Poltava Regional Exhibition in 1940 and then at a national exhibition in Kiev. They were highly appreciated by art-lovers and art-critics. Inspired by this success, the artist went to Kiev and Moscow "to see real paintings by real masters" and afterwards created a series of wonderful compositions permeated with love for her native land and its industrious people. Unfortunately, all of the works displayed at the Poltava exhibition in 1941 perished during the Second World War. Only some works ef the period, which were not entered in the exhibition, have been preserved (Flowers and Birches at Eventide, Flowers in Fog, Dahlias, Field Flowers). The two years spent on fascist-occupied territory were the most trying in the life of Katerina Bilokur. Only a few pictures were made in this period — Flowers and Flowers at Eventide (1942), and Flowers (Lilies) which she finished by the end of 1943. After the liberation of her native village, Bilokur creates new compositions. Luxuriant Vegetation, Decorative Flowers (1945), Bounties of Nature (1946), 30th Anniversary of the October Revolution (1947), and her famous canvas Ear the King which is unrivaled what regards its eslhelic and emotional impact. The 1950s were the most productive years in Bilokur's artistic career. She made such original and bright still-Iifes as Apples and Tomatoes, Breakfast (1950), Watermelon, Carrots and Flowers (1951), In Shramkivka Dislrictof Cherkassy Region (1955—1956), Flowers and Crapes (1953—1958) which are distinguished for their freshness and verve. Through the artist's fantasy the flowers, vegetables and utensils limned in these pictures turn into a canto glorifying nature, man and his deeds, into symbols of beauty. Being scrupulously and faithfully depicted, each detail in Bilokur's pictures is perceived as a really existing one. Their realistic representation is to no lesser degree sustained by the artist's subtle sense of color. Light and shade smoothly wavering into each other and a soft gamut of colors are typical of all her works. 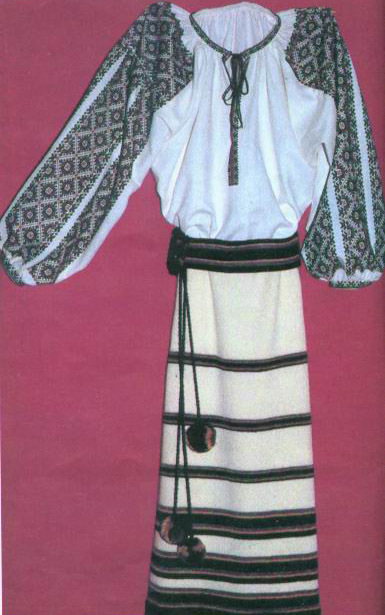 The main effect is produced by the use of pure colors which is characteristic of folk decorative art on the whole. In the 1950s Bilokur made her first attempts in water-color painting. Her best works of the period — Bohdanivka Village in September, Beyond the Village (1956), Early Spring (1958), Autumn (1960) — are noted for their extraordinarily emotional expressiveness. During the last years of her life, which were dimmed by serious illness, Katerina Bilokur created a number of notable pictures such as Dahlias (1958), Peonies (1958). Bohdanivka Apples (1959), Bunch of Flowers (1960) and others. Kalerina Bilokur died June 9, 1961. Her creativity has won her general recognition. She was given the honorable title of People's Artist of the Ukrainian SSR and awarded the Badge of Honor and a diploma of the Supreme Soviet of the Ukrainian SSR. In her native village a monument was erected in her honor. At all times of the year its pedestal is covered with flowers which she so admired. In one of her letters K. Bilokur wrote: "You may not like my work as I paint only flowers. But how can I not paint them if they are so beautiful! When I begin a picture of flowers I think sometimes: when I finish it I'll do something from the life of the people. But by the time I finish it, my imagination already draws new pictures, and all of them—flowers. That's the long and the short of it. When spring comes around, and the fields turn green, and flowers begin to bloom, each prettier than the others... My Cod, I forget everything, and again take to painting flowers. Don't be angry with me, my close and distant friends, for me painting flowers, because the pictures with flowers are beautiful." 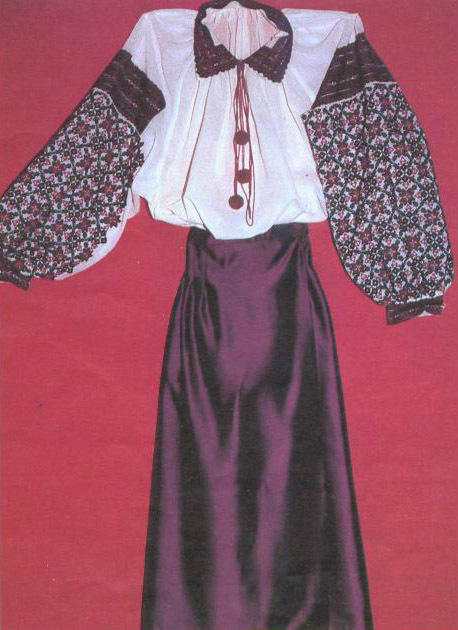 Katerina Bilokur righlfully occupies a leading place in the history of Ukrainian folk art. Bilokur's art is based on her profound knowledge of nature and folk art traditions, and the impact her canvases produce is really unforgettable. The cosy apartment of Maria Zarembska, an embroideress, is full of books. You can see them everywhere — on her desk, on the windtowsill and even in the kitchen. The eye falls on volumes of poetry by Taras Shevchenko, Lesia Ukra'inka, Ivan Drach and Lina Kostenko, all interleaved with countless bookmarks. by magic powers of the night. I shall offer my private prayer. Maria quoted these lines before we began our talk. Their tuneful rhyme seemed to affect her deeply. Is it possible to be brief about the creative powers of this artist? I should begin by saying that every stitch of her needle, like the touch of a brush applying paint to the canvas, is rich and textured. Maria Zarembska's compositions are exquisite and harmonious, quiet and rhythmically coordinated. At the same time they reflect the mystery cast in all probability by Lesia's poems, which Maria is so fond of, or by the thicketed forests of the Podillya land. This enigmatic quality is present even in the titles of her works: "The Charms of Love", "Forest Song", "The Magic of the Sunset", "The Podillya Legend"... Only the embroidered towel "Mother's Song" seems to contain within itself the clear and translucent world of motherhood. The artist boasts an extraordinary sense of composition and has an extremely good eye which enable her to bring the drawings on the canvas to life with unusual accuracy. Maria's inborn taste is refined, and the range of colors the artist uses makes her creations genuine wonders. In her work Maria uses techniques traditional to Podillya: "Podilska nyz", "kachalochka", cross and "shtapivka" stitches. It is interesting to trace how she is developing her own unique style: for example, in her refusal to execute vegetable ornamentation, giving preference to geometrical designs. 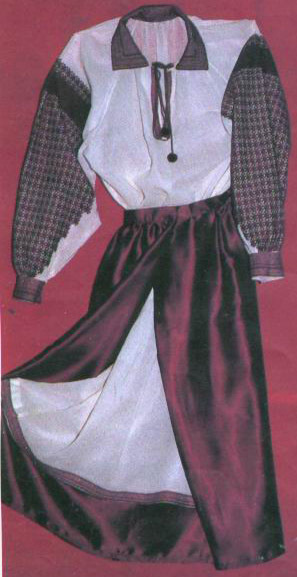 The master embroideress is also very demanding in her selection of color. She tends to work with serene tones, but not without contrast. Black and cherry-colored threads, or bright accents of emerald, yellow and red against a black velvet background are favorite combinations. When her needle threads in the ornamentation nobody can match her magic. "It happens that I wake up during the night because of a wonderful drawing in my dream. And I grab my pencil and hurriedly transcribe the vision onto a sheet of paper so that I can have it embroidered later. But my drawing can never quite reproduce what I saw in my dream, much less the finished article, which is far removed from that vision". Maria makes her ornamentations easily and spontaneously, expressing them as a musician would sing a song. Though her most complicated patterns take a lot of her time it seems that a drawing is being created before your very eyes. "I would like my embroidered pieces to be a kind of story about myself, about my real self," says Maria. Her desire is both sophisticated and natural. The artist reveals us her own inner world, and we, ex- amining this world, try to understand her as a creator and a human being. Her recollections of her childhood years are the dearest and brightest for Maria. Talking of her native village of Kopychantsi in Ternopil Region, about her mother, father, brothers and sisters it is as if she sings a hymn to her parents' home, their large and friendly family, her mother's love. Maria can talk about her mother for as long as you will listen to her, and her voice trembles with extraordinary gentleness. "To this day," goes on Maria, "I cannot make out when my mother used to go to bed, or when she got up. It seems as if her restless hands never knew what leisure is. She raised five children and looked after my father who was seriously ill. My mother and father lived together in peace and concord for the entire fifty years. Mom always had a smile on her lips, her temper was calm and balanced, yet she was a very demanding person. She had a beautiful voice and sang with the village choir. Mother knew a great many folk songs. She was a perfect housewife and a highly skilled needlewoman. Most probably, when I first saw the light my mother wrapped me in an embroidered towel, passing onto me in this way her inborn inclination." The reality was not exactly so. Hanna Zarembska, watching her energetic, restless and disobedient Marichka decided to use her own method of teaching. The woman realized that in order to restrain her daughter's explosive energy she would have to teach her the craft of embroidery. This would teach the child the patience she lacked. Oh, how difficult it was for the naughty child to sit next to her mother quietly producing stitch by stitch! She could hardly restrain her desire to jump up and head her way to the pond and the nearby forest where she knew so closely every path, every bush! 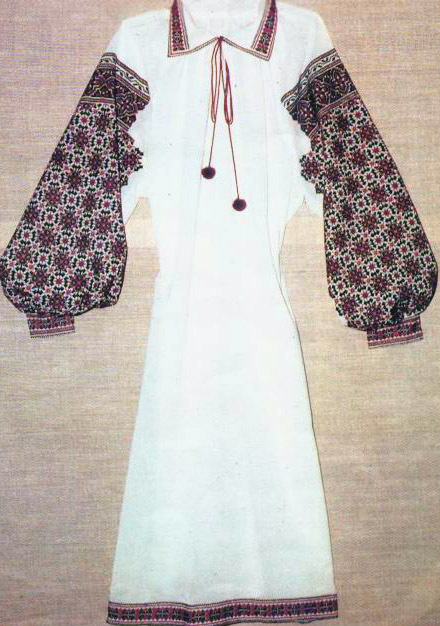 The girl was still a school student when her embroidered pieces became noticed and found themselves on display. Marichka's creations received favorable comments from both the experts and the media. But it was not only the success of this presentation that determined the choice of her path in life. The young girl decided to devote herself to this folk art for the wonderful experience it gave her: she felt both relaxed and inspired when she was doing her needlework. She had a feeling as if wings started to grow behind her back! Maria's vision of the surrounding world also changed. Now she looked at it through the eyes of an artist and a creator, and this world appeared much better and richer. Maria realized that it was quite possible to convey on a strip of canvas the subtlest nuances of human feelings and put into her stitches and patterns love, joy, sorrow, despair. ...One day I happened to visit Maria Zarembska's one-man art show. Across the hall I saw a young girl standing before an exhibit who could not tear her eyes away from the beautiful ornamentation of the embroidered towel. Then the girl reached for her notebook and became immersed in copying the pattern. To me, it was a symbolic act — it proved that the undying traditions of folk art are being passed over from generation to generation. And this art will always gladden the eye and the heart with its sincerity, harmony and beauty.